Ultra‐Smooth, Chemically Functional Silica Surfaces for Surface Interaction Measurements and Optical/Interferometry‐Based Techniques. H. Dobbs, Y. Kaufman, J. Scott, K. Kristiansen, A. Schrader, S. Chen, P. Duda III, J. Israelachvili. Advanced Engineering Materials (2018) 20 (2), 1700630. Recent advances in the surface forces apparatus (SFA) technique. J. Israelachvili, Y. Min, M. Akbulut, A. Alig, G. Carver, W. Greene, K. Kristiansen, E. Meyer, N. Pesika, K. Rosenberg and H. Zeng, Reports Prog in Phys (2010) 73, 1-16. Adhesion and Short-Range Forces Between Surfaces: New Apparatus for Surface Force Measurements [SFA 3]. J. N. Israelachvili and P. M. McGuiggan, J. Mater. Res. (1990) 5, 2223. Thin Film Studies Using Multiple Beam Interferometry. J. Israelachvili, J. Colloid Int. Sci. (1973) 44, 259. The extended surface forces apparatus. Part III. 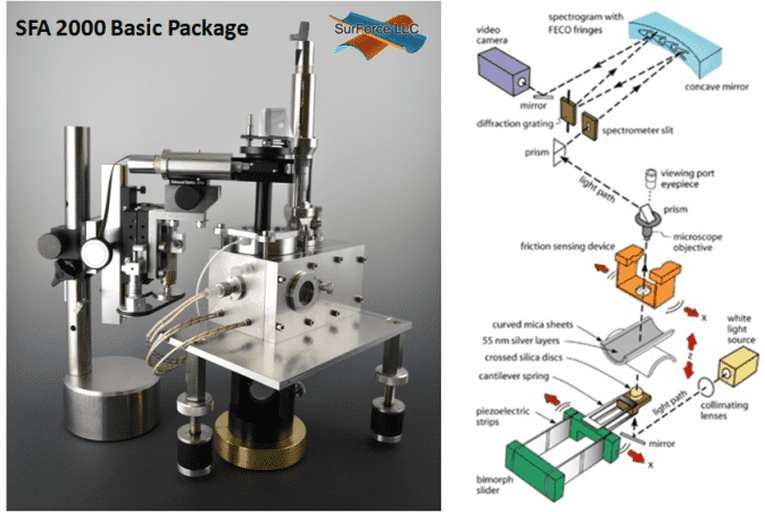 High-speed interferometric distance measurement. Zäch, M., J. Vanicek, and M. Heuberger, Review of Scientific Instruments. (2003) 74 (1) 260-266. Extending the surface force apparatus capabilities by using white light interferometry in reflection. Connor, J.N. and R.G. Horn, Review of Scientific Instruments (2003) 74 (11) 4601-4606. Topographic information from multiple beam interferometry in the Surface Forces Apparatus. M. Heuberger, G. Luengo, J. Israelachvili, Langmuir (1997) 13, 3839–3848. The electrochemical surface forces apparatus: The effect of surface roughness, electrostatic surface potentials and anodic oxide growth on interactions forces and friction between dissimilar surfaces in aqueous solutions. Valtiner, Markus; Banquy, Xavier; Kristiansen, Kai; Greene, George; Israelachvili, Jacob. Langmuir (2012) 28 (36) 13080–13093. The intersection of interfacial forces and electrochemical reactions. Jacob N. Israelachvili, Kai Kristiansen, Matthew A. Gebbie, Dong Woog Lee, Stephen H. DonaldsonJr., Saurabh Das, Michael V. Rapp, Xavier Banquy, Markus Valtiner, and Jing Yu, JPCB (2013) 177 (51) 16369−16387. Interferometry of surfaces with well-defined topography in the SFA. Gupta R & Frechette, J. Colloid. & Interf. Sci., (2013), 412, 82-88. Surface-initiated self-healing of polymers in aqueous media. B. Kollbe Ahn, Dong Woog Lee, Jacob N. Israelachvili & J. Herbert Waite, Nature Materials (2014) 13 867-872. Analyzing refractive index profiles of confined fluids by interferometry. Daniel F. Kienle and Tonya L. Kuhl, Analytical Chem., (2014), 86, 11860-11867. Real-time MBI reveals complex deformations of metal-organic-framework upon humidity adsoroption/desorption. Theodoros Baimpos, Buddha Ratna Shrestha, Qingyun Hu, Georgi Genchev, and Markus Valtiner, J. Phys. Chem. (2015), 119, 16769-16776.